ALT or Argon Laser Trabeculoplasty is the original procedure for Laser Trabeculoplasty but has been largely replaced by the newer SLT procedure. However, ALT is sometimes still used, and so we provide a general overview of the procedure below. Laser trabeculoplasty (LTP) involves the application of a laser beam to heat areas of the trabecular meshwork drainage in order to increase fluid outflow and thus lower intraocular pressure. LTP is used in the treatment of various open-angle glaucomas. ALT was the first of the Laser trabeculoplasty procedures introduced for the lowering of intraocular pressure in patients with open angle glaucoma. LTP is used in the treatment of various open-angle glaucomas. The two types of laser trabeculoplasty are ALT and the newer and improved Selective Laser Trabeculoplasty (SLT). In this article we will cover the first Laser procedure, ALT. ALT was originally introduced by Wise and Witter in 1979 for the treatment of open angle glaucoma. The original glaucoma laser trial was studied for safety and effectiveness in eyes that received ALT at 360 degrees of the trabecular circumference. From a period of 2.5 to 5.5 years of follow up, the results demonstrated an efficacy comparable to medical therapy in pressure reduction. However, the procedure did not replace medication therapy ultimately, because of a loss in efficacy over time. Newer and more effective glaucoma medications like the prostaglandins were later approved for use, which in many cases caused a more significant reduction in eye pressure.. The efficacy of ALT treatment has shown a response rate of greater than 80%. However, factors such as diagnosis, trabecular pigmentation, age, and other conditions must be considered. In the optimal patient, response is approximately a 25-30% reduction of IOP from the initial pressure. Patients with primary open angle, pigmentary, or pseudoexfoliation glaucoma tend to do well with laser trabeculoplasty because a densely pigmented trabecular meshwork absorbs the laser energy more readily. Some forms of open angle glaucoma, such as glaucoma from trauma or aphakia (previous cataract surgery without intraocular lens replacement) however, may not respond as well as primary open-angle glaucoma. More densely pigmented trabecular meshworks respond better to laser since pigment facilitates the uptake of laser energy (e.g., pigmentary and pseudoexfoliation glaucoma). Lightly pigmented trabecular meshworks may require more laser energy compared to densely pigmented trabecular meshworks and may be therefore less successful. The optimal candidate is a patient with an open angle with a densely pigmented trabecular meshwork. If the angle is closed or narrow, a laser iridoplasty or a peripheral iridectomy is performed beforehand to deepen and allow better visualization of the angle; a laser iridoplasty is often performed simultaneously with ALT, but when a peripheral iridectomy is performed, ALT is done a week later because of possible anterior chamber debris. It is customary to instill pressure lowering eye drops 30–60 minutes preoperatively to minimize IOP elevation after treatment. ALT is usually performed in an office setting, and usually takes less than 10 minutes. Patients rarely experience discomfort during the procedure. Once the eye is anesthetized with a topical eye drop, a gonioscopic contact lens is placed on the surface of the cornea. The gonioscopic contact lens allows for visualization of the drainage angle. The laser spots are then delivered to the trabecular meshwork. Either 180º or 360º of the angle is treated per treatment session. Each area of the angle is treated only once to avoid scar formation in the angle. After the procedure, another pressure reducing drop is instilled to prevent post-operative IOP spike. The IOP is measured approximately 1 hour after the procedure to ensure that it is stable. 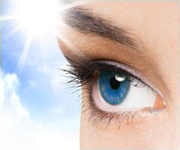 Patients are advised to continue the glaucoma medications used prior to the laser treatment. A short course of anti-inflammatory drops is usually given to reduce post-operative inflammation. Patients return for a follow-up examination in about a month to determine if the ALT treatment was successful. If IOP is still uncontrolled, additional surgical intervention may be necessary. Success rates for ALT vary. The overall success rate is approximately 50% over 5 years. Many patients then require additional intervention to control IOP. The most common complication of the ALT procedure is a post operative IOP spike. Typically, this pressure elevation is temporary and the result of inflammation from the procedure, and is usually controllable with additional IOP lowering medications. Iritis inflammation is another possible complication, but can be offset with post operative topical steroids - which are used for up to a week after treatment. Peripheral anterior synechiae or scarring of the iridiocorneal angle may also occur as well as changes to the cornea. These latter problems are more common in eyes with narrower angles. The newer Selective Laser Trabeculoplasty procedure replaces ALT in most cases because it has fewer side effects and can therefore be redone. ALT causes more inflammation and tissue damage because it does not selectively target the pigmented tissue and this causes more unnecessary damage to the surrounding trabecular tissue.